Set up like a gameshow, the game features ten challenges hosted by a holographic host named Earl, and his camera-bot, Meyer. There are (currently) sixteen lab activities that can come up at random over the course of the game. These activities are scored for accuracy, time, and safety, resulting in an overall score. Doing well can win you an elemental trophy, as well as a place in the famed Hall of Brains. There are two things that turned from a worry to absolute surprise in HoloLAB Champions the moment I started playing. In a game built on precision of measurements, I was worried that the fidelity of the Vive’s wands simply wouldn’t be sufficient to handle the chemical mixing. I was also worried that it would be hard to read the instructions and the gradients on the various lab instruments. Both of those things turned out to be non-issues which are best illustrated by showing you some of the sixteen lab practice side activities you can tackle outside of the main game. As you can see, the game asks you to measure things in a highly precise way and that means looking at the gradients on graduated beakers, erlenmeyer flasks, a pipette, a tare scale, and more. The Vive (I am not using a pro version) is able to handle this just fine, providing a very clear and easy to read font. I was able to discern measurements down to the millimeter! Fret not if you don’t know what some of these lab implements are because HoloLAB is built to teach you while you are having fun. At one point, I had to laugh as I spooned out a carefully extracted scoop of yellow dye, gently tapping the virtual glass of my virtual beaker to ensure all of the granules made it into the mixture. It’s easy to get lost in your measurements. It’s not all spoons and pipette drops at HoloLAB Champions. Some of the later stages will begin to challenge the M part of the S.T.E.M. (science, technology, engineering, and math) program. Under the constant game show time crunch, you’ll be asked to perform some basic multiplications to determine volume, mass, and manipulate both on the fly. While the first few challenges may ask you to ‘eyeball’ something ‘around’ 47 ml of fluid, the latter stages will ask you to precisely calculate and measure things down to the tenth of a milligram. It pushes your brain, forcing you to think on your feet — something most adults might not have done since their high school chemistry class. 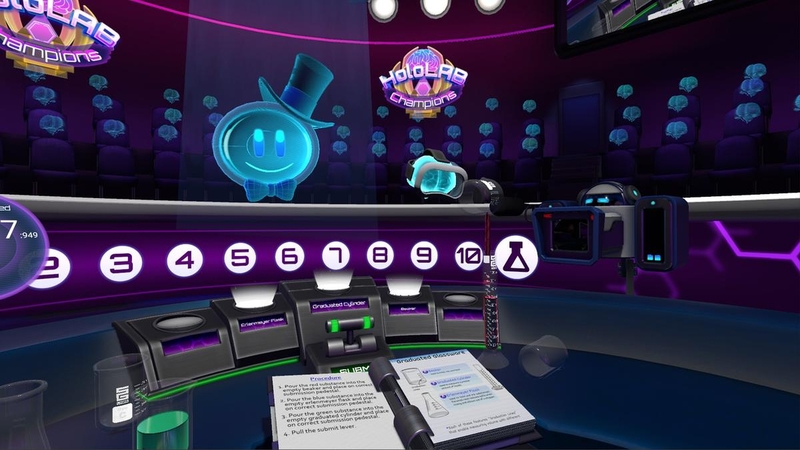 While HoloLAB Champions was clearly designed with the classroom in mind (though it is fun outside of that application), it got me thinking about all of the places that can’t afford a lab, chemicals, or the reagents involved in learning applied science. Sure, a VR kit might be equally as difficult to come by, but in this way it could be a path for many students to experience applied sciences without consumables, and in a way that transcends the way all of us were taught. At just $9.99, HoloLAB Champions is a fun way to introduce kids to science, and it’s never too early (or late) to get started. My only complaint with HoloLAB (and I sincerely hope it’s something Schell Games patches in) is that the required measurements are not randomized. This means several of the puzzles can be beaten very quickly by simply memorizing the elements. Randomized values would push the players to create different volumes, challenging their skills in new ways each time. Just like I Expect You To Die, HoloLAB Champions is played from a stationary position, meaning it is a zero-nausea experience suitable for all audiences and play spaces. It can be played standing or seated, and its stylized presentation keeps it looking sharp and with a stable framerate on any reasonable machine.